Hiking is what you make of it – go for the photos and granola snacks, or go for the exercise and adventure. 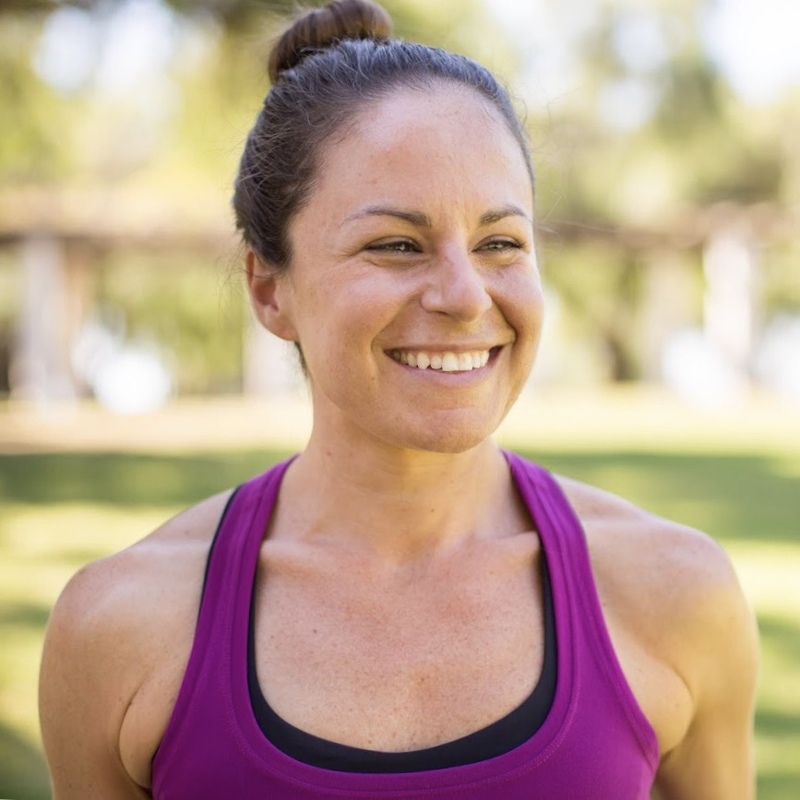 But whether you’ve lived in San Diego your whole life or you were one of the smart ones that migrated here, you know that San Diego is the mecca of outdoor activity. You can get from the mountains to the beach all in the same day – and everywhere in between. Lace up your shoes, fill up your water bottle, pick your favorite scenery, and get off the road and on the trails. Looking for a quick jaunt that is sure to impress? La Jolla Coast Walk Trail is perfect! 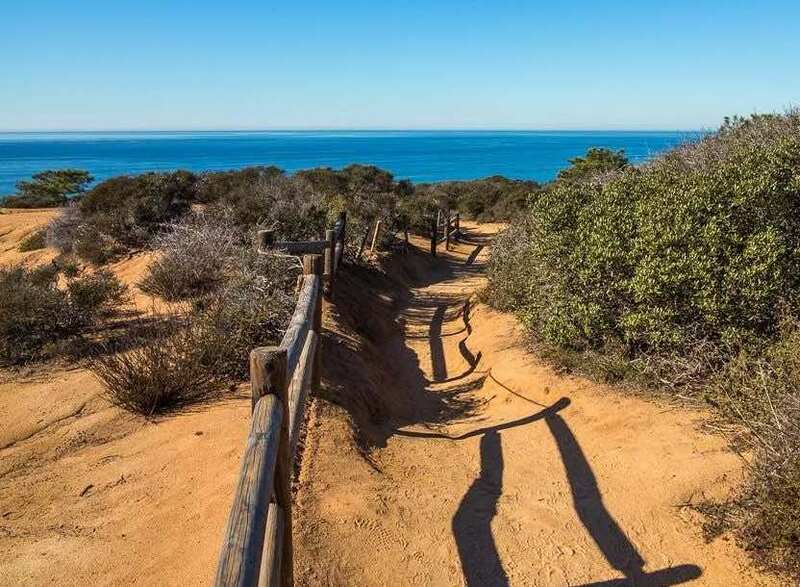 Impress out-of-towners and hop on this short trail just off of Cave Street in the cove and amble down to a viewpoint that will give you access to the infamous sea lions, plus a view of the coast (both north and south) that is unparalleled. Continue up the trail and pause at any one of the conveniently placed benches to take in the view and soak up the sun. 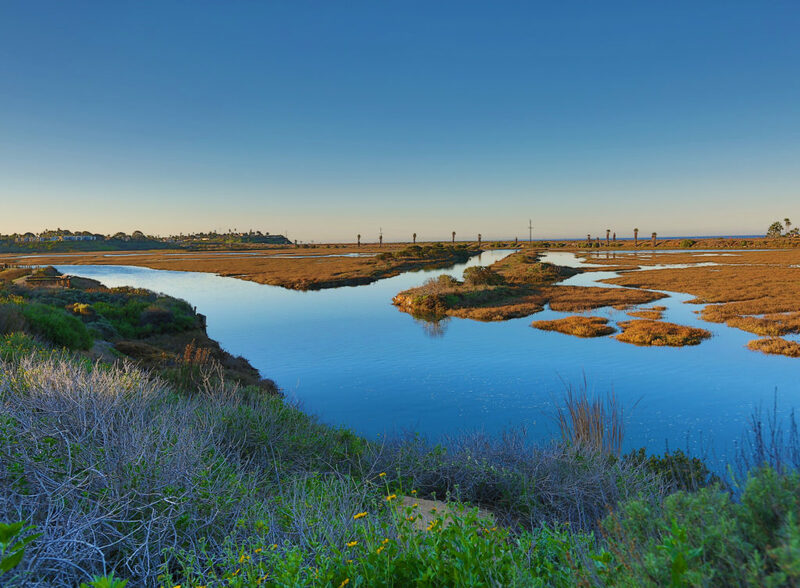 Situated in Solana Beach, the San Elijo Lagoon runs east to west from the coast, under the 5 freeway, and all the way to the ritzy Rancho Santa Fe neighborhood. Along the south side of the lagoon, you’ll find seven miles of San Elijo trails and the Mushroom Caves. These cavernous caves carved into sandstone are one of the more unique sights in San Diego and will immediately transport you to a different planet. Explore away! “Essential Southern California” is how most people would describe Torrey Pines. 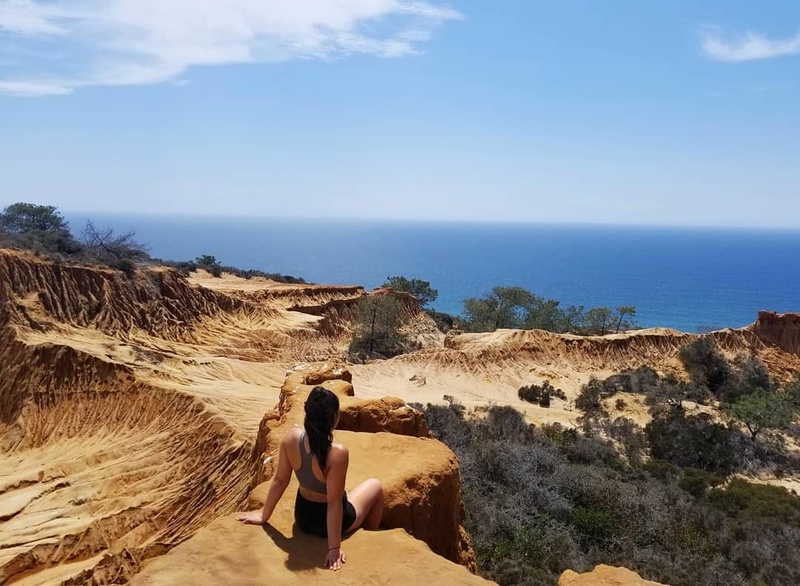 Aside from the fancy golf course by the same name, the Torrey Pines trails are a system of well-maintained pathways that lead you up to (and in some cases over) the edge of the cliffs overlooking the Pacific Ocean just north of La Jolla. The docents (super smart guides) at Torrey Pines are filled with great knowledge and are always happy to tell you about the nature you’re experiencing – like the fact that the Torrey Pine is the rarest native pine in the United States! You could spend all day exploring here…or a quick a half hour lunch break. Choose your own adventure. Continuing south down the coast you’ll find yourself in Ocean Beach, the beach town perpetually stuck in the 1970s. 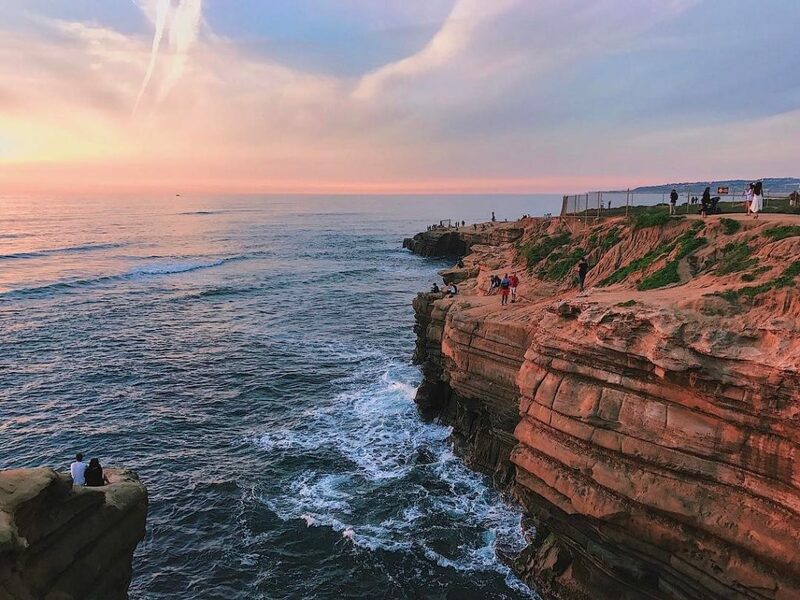 Drive past all the tie-dye until you reach Sunset Cliffs Natural Park, the beautiful stretch of 68 acres bordering the Pacific Ocean. 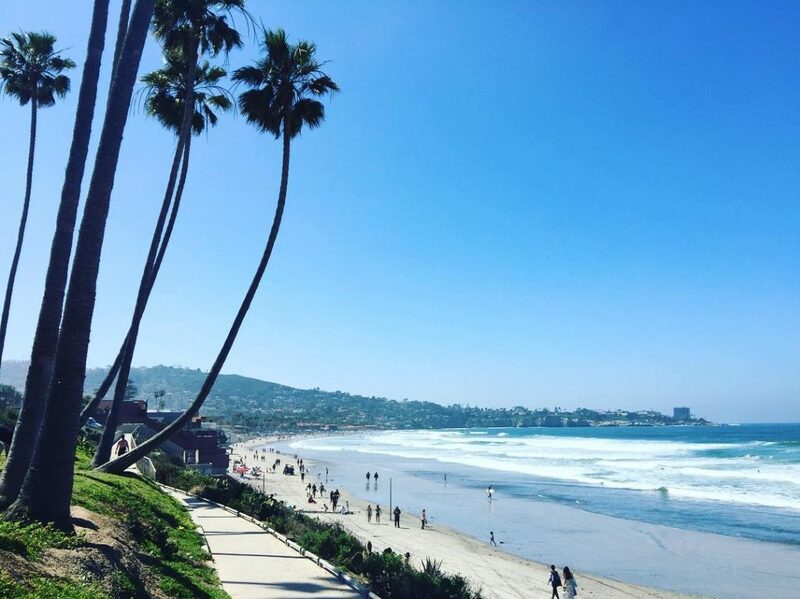 Walk along the paths and be treated to some of the best views in San Diego. *cough* Take a date *cough* Keep an eye on the ocean for surfers enjoying a few of the most popular breaks, as well as grey whales during migration season! Lake Hodges is actually a reservoir just south of Escondido and about a half hour’s drive outside of San Diego. 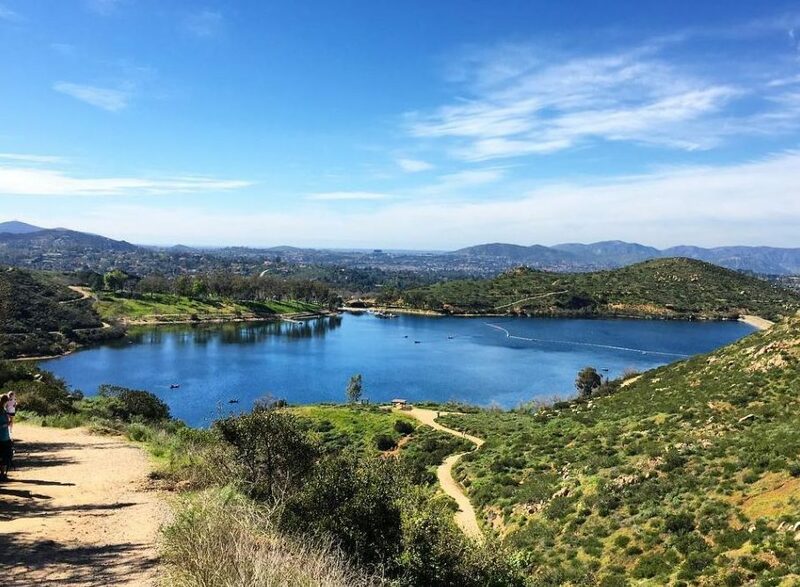 Surrounding the lake, you’ll find miles of trails that loop around the shimmering water – it’s sort of beautiful… Make it far enough around the lake and to see the dam that sits on the San Dieguito River and creates the reservoir. All year long these trails are packed with hikers, trail runners, and mountain bikers, tackling the varied terrain. And we think the seven-mile out-and-back primary route is just the right distance to be hiking, without being camping. Get yourself here while the water still exists (kidding. But not really. Because droughts). “Los Peñasquitos” translates to “little cliffs”, and these little wonders create a unique trail experience just north of the city. 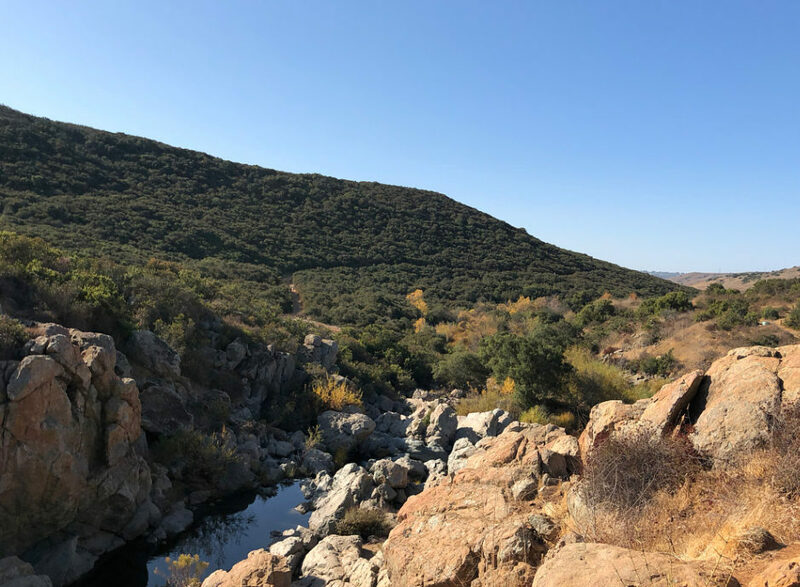 Across miles of trails that criss-cross the creek, you’ll find a waterfall, multiple wooden bridges, giant California live oaks, a grove of sycamore trees, and the opportunity to see any of a handful of animals like deer, bobcat, coyote (hopefully from afar), raccoon, to name a few. When you hike here, be ready for adventure! Just a quick hour outside of San Diego, this hiking spot feels like an entirely different world. It exists on the east side of the Cleveland National Forest at about 6,000 feet of elevation. 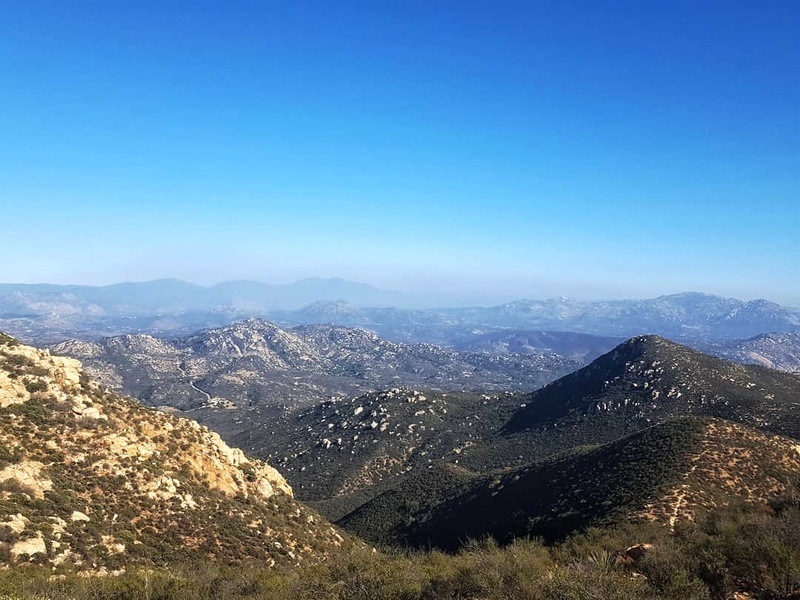 Just the drive up Mount Laguna is scenic — in fact, it’s called the Sunrise Highway, and you should leave early enough if you want to witness its beauty. The best part about Mount Laguna though? 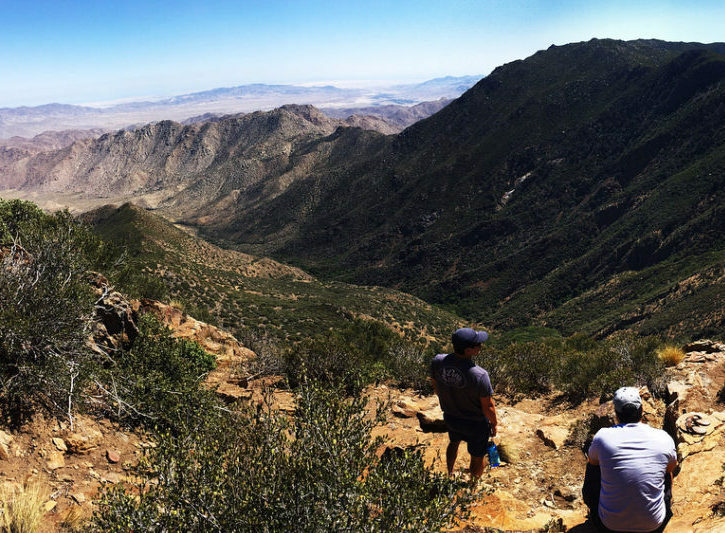 Miles of the epic Pacific Crest Trail (2,659 miles total from the United States border with Canada to the border with Mexico) traverse Mount Laguna. Fitt Tip: bring a backpack with the essentials, like socks and trail mix. The only controversy surrounding Cowles Mountain is how to pronounce the name (coals vs. cow–les). Aside from that, we have peace. 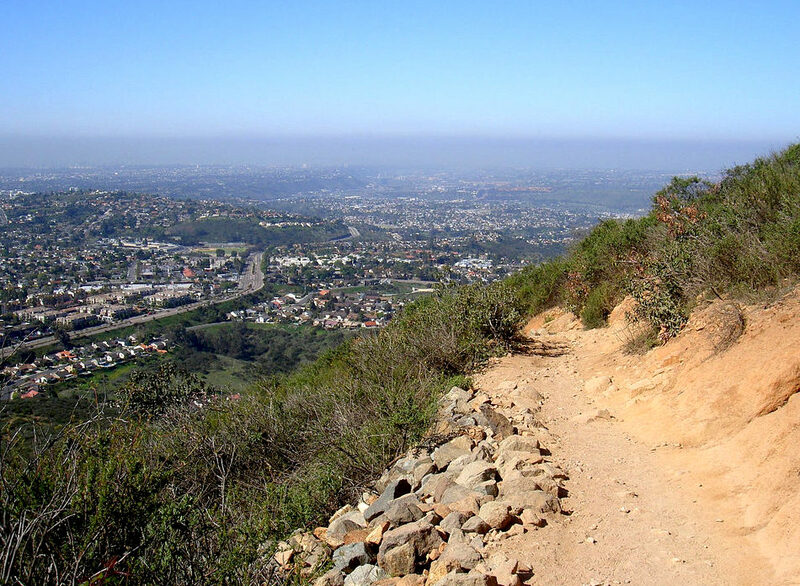 Pretty much everyone agrees that this is one of top hikes in San Diego in terms of popularity. It’s easily accessible, well-maintained, and juussst challenging enough (2.9 miles and 950’ of elevation). Get out early and bring your water; it does get crowded and warm! But let us tell you: The views at the top are worth it all – on a good day you can see the ocean! 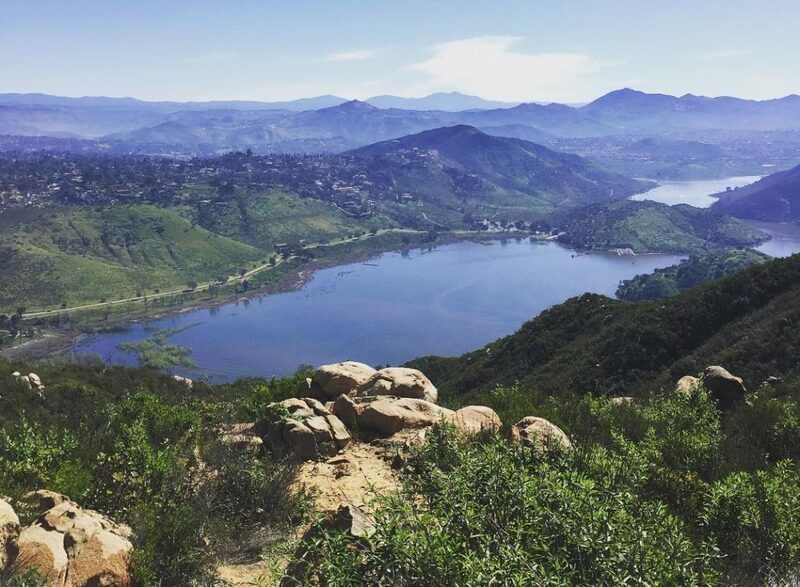 A hike on Iron Mountain in Poway, a city just northeast of San Diego, has a grand total of 5.3 miles and 1100’ of elevation gain. Seriously, this hike is nothing to sneeze at. Go in the spring to see a beautiful assortment of wildflowers blooming and enjoy the backdrop of amazing boulders all year round. And like many of the other popular hikes, this trail does enjoy heavy traffic during the weekends, so come out on a weekday for solitude and peace and quiet. Possibly the most Instagrammed hike in all of San Diego county, Potato Chip Rock lies at the top of Mount Woodson. And it’s not just because of the mountain of potato chips (we’re kidding, you have to bring your own chips). This almost seven-mile round-trip hike gains (and loses) over 2000’ of elevation on its way up and down to Potato Chip Rock. A few insider tips: bring more water than you think you should; be prepared for it to be well-trafficked on the weekend; and (for goodness sake) don’t wait in a line at the top to take your photo on Potato Chip Rock. There’s plenty of other amazing backdrops for your next Tinder photo. Stand out from the crowd!